smoothie Archives - Are We Zen Yet? 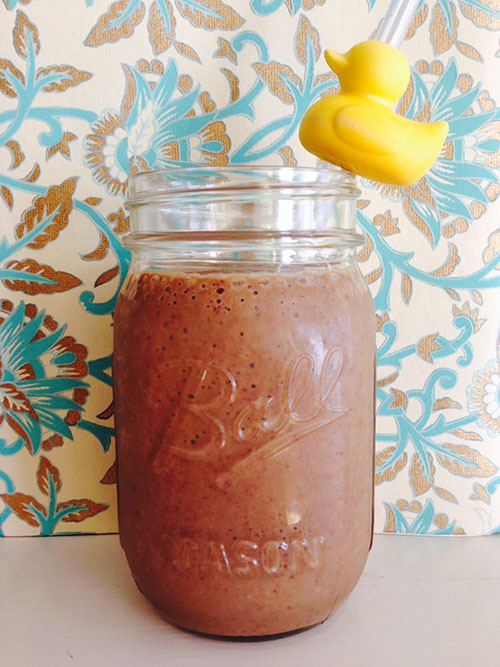 This Black Forest Smoothie Recipe was born out of a lot of leftovers. I had made some coconut curry the day before and had some leftover coconut milk, I had an open bag of frozen cherries in the refrigerator, and the last of a big tub of spinach. This smoothie came out even better than I’d hoped. It’s a great blend of creamy, sweet and tart. I wish I could report that no smoothies were harmed in the making of this blog post, but unfortunately, the smoothie pictured above met its demise shortly after I took this photo. Kidday asked for a sip of my smoothie lunch and no sooner did I say “Please be careful, it’s in a glass cup” than I heard a huge thud on the floor and saw a chocolate flavored Jackson Pollack gracing the canvas of our floor, stove and dishwasher. Put all ingredients except melted coconut oil in your high speed blender. Once blended, add in the melted coconut oil and blend again to incorporate.